Premiere Pro is Adobe’s industry-leading video editing software, you can edit virtually any type of media in its native format and create professional productions with brilliant color for film, TV, and web. Adobe Premiere Pro CC frees you to focus on your creative work, and it’s available only in Creative Cloud. Edit anything from virtual reality to 8K footage in native format or by creating lightweight proxies that let you easily switch between low- and high-res formats. Enhanced Lumetri Color tools give you new ways to get creative with color, plus you can apply new preset SpeedLooks in a single click. Save time and stay in your creative flow with improved integration between Premiere Pro, After Effects and Adobe Audition that eliminates steps like intermediate rendering. Collaborate on shared sequences or compositions across Premiere Pro, After Effects, and Prelude with Adobe Team Projects (Beta). For teams and enterprise customers. Collaborate and share sequences and compositions in real time with Team Projects (beta). Features like version control and conflict resolution are built right into Premiere Pro, After Effects, and Prelude so teams can work better together. Eliminate intermediate rendering between Premiere Pro and Adobe Audition or After Effects for more seamless workflows. Faster performance delivers higher frame rates during playback. Skip transcoding and edit virtually any type of media, from smartphone video to 8K footage, thanks to broad native format support. Premiere Pro now supports even more formats, including Native QT DNxHD/DNxHR export and RED Helium. Work through edits faster using keyboard shortcuts to navigate keyframes and zoom in and out of individual frames on the Timeline. Use the new Remove Effects command to quickly take out specific effects. Start editing footage in virtually any format while your media transfers in the background. Once it’s done, Premiere Pro switches to the copied media to free up your camera. What hardware will make Adobe Premiere Pro CC run even better? Does Adobe Premiere Pro support the hardware, camera, and other software I use? Adobe Premiere Pro CC has a scalable architecture, so performance scales with the speed of your system. The minimum system requirements for your workflow depend on the type of content you plan to work with. See the system requirements for Adobe Premiere Pro CC. With native 64-bit support, Adobe Premiere Pro can take advantage of all the available RAM on your system. For multicore systems, Adobe recommends 4GB or more of RAM per core. On any system, you will see substantial performance gains as you add more RAM. 16GB of RAM is a good baseline if you plan to run multiple applications simultaneously. Plus the Adobe Mercury Transmit plug-in enables tighter integration with third-party I/O hardware. Does Adobe Premiere Pro support the hardware, camera, and other software I use? 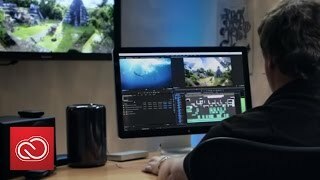 Adobe Premiere Pro supports a broad range of hardware and software for Mac OS and Windows, so you can choose from a range of workstations and capture cards to build the editing system that meets your needs and budget. Enhance your system with additional plug-ins, including many from Adobe After Effects®. Adobe Premiere Pro CC works with a variety of third-party hardware, including capture cards and decks. With comprehensive video format compatibility, you can work with the formats you want, including natively editing files from the latest tapeless formats without transcoding or rewrapping. Edit all standard- or high-definition formats, from DV and HDV to HD and beyond. Some formats may require additional hardware. Adobe Premiere Pro CC is available as a standalone application or as part of the Creative Cloud Collection on both monthly and annual plans plans.